1. Some of your products may be broken, damaged, or expired. Toss them and leave only the products and tools that are in good condition. 2. Divide products and tools according to use. Put all lipsticks and lip balms together, while storing eye shadows, mascara, and eye liners in some other section, for example. This will give you a better idea of what products you need, and which you have a lot of. 3. Makeup brushes should be stored separately, somewhere they stay protected from damage and bacteria. But remember to clean them with shampoo or soap once a week anyway. 4. Wether you choose to display your makeup stash or store them in a drawer, make sure they're protected from sunlight and steam. In order to prolong the life of the products, they should be put in a cool and dark place. 5. Get inspired. 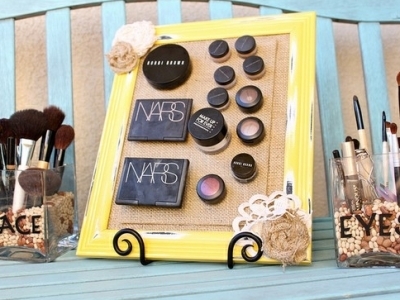 There are so many different ideas to organize your makeup and make it look attractive and decorative. From bowls, vases, boxes, bags... there's even a great DIY idea that saves up all the space, look here! You have so much to choose from, you really don't have any excuse to skip the organization station. So, will you be organizing your cosmetics stash before summer arrives?